Gov. Haslam visits Cannon Co.
Gov. 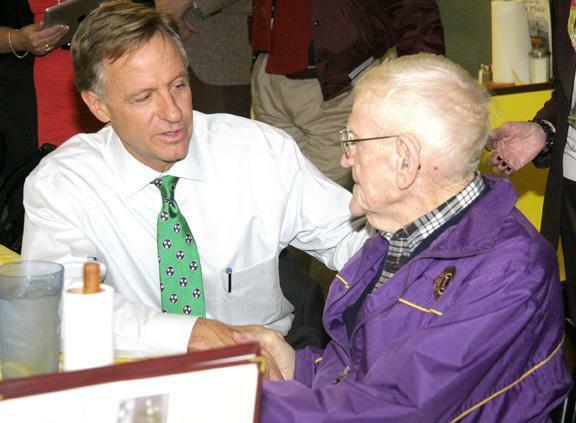 Bill Haslam exchanges words of wisdom with 99-year-old Nolan “Dude” Northcutt during his visit to Joe’s Place. The restaurant was jammed with the governor’s supporters and others wanting to meet him. Gov. Bill Haslam brought his "Tennessee Promise" message to Woodbury Thursday (Feb. 27) with a visit to Joe's Place. The restaurant was loaded with Haslam supporters and others wanting to meet and greet Tennessee's governor. It was the governor's second recent visit to Cannon County on a day that marked Haslam's post-election visit to every county in Tennessee. "As of today, we have hit every county as governor," Haslam told the crowd during his brief remarks at the restaurant. The governor emphas-ized the "Tennessee Promise" program that was highlighted during his Feb. 3 State of the State speech before the Tennessee General Assembly in Nashville. "We just announced the 'Tennessee Promise' program which is divided into two basic concepts. First, we are fighting the rising costs of higher education and secondly, we are raising our expectations as a state," Haslam said. "The reason we're doing this is that many jobs in the future are going to require more than a high school education," he said. "Tennessee Promise" will provide on a continuing basis two years of community college or a college of applied tech-nology (TCAT) absolutely free of tuition and fees to graduating high school seniors. After graduating from a community college, if students choose to attend a four-year school, the state's transfer pathways prog-ram makes it possible for those students to start as a junior. By getting their first two years free, the cost of a four-year degree would be cut in half. The program will also provide a mentor for each high school graduate. "Tennessee Promise" will begin with juniors in high school in 2015. It will be funded through a continuing endowment. Haslam's visit to Joe's Place was marked by rounds to hand-shaking and photo taking as the governor worked his way through the crowd. Grabbing his attention was 99-year-old former Woodbury Mayor Nolan "Dude" Northcutt and his exploits. "You still mow your own yard?" the governor asked. "That's impressive." Haslam was also impressed with news of the Arts Center of Cannon County. "We have one of the best arts centers in Tennessee," state Rep. Mark Pody. "It's funded now by ticket sales." Pody also invited the governor to the upcoming (April 5) Stones River Relay that begins with a run on the top of Short Mountain. "I'm OK with the running and riding, but the paddling … whew," Haslam laughed. 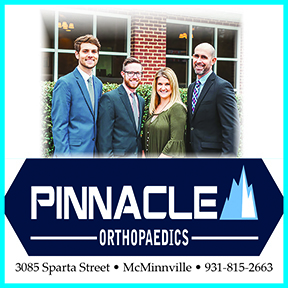 "Unfortunately, I'm going to be riding a mule at Mule Day in Columbia on that day."